TIA is accredited by the American National Standards Institute (ANSI) as a standards developing organization (SDO). TIA's engineering committees create standards and technical documents based on guidelines established by the ANSI Essential Requirements. While most of us rarely think about standards, they are essential to keep our daily lives running smoothly. Standards establish universal protocols that ensure the compatibility and interoperability of technology that is essential to daily life. Where components interact, there is a flow from one component to the other, perhaps information, electricity, water, fuel or something else altogether. To achieve functionalities, components must interact in pre-defined and known ways, even though they may be designed and developed at different times by different groups of people. Known interactions are achieved through the use of standards. Standards make it possible to compare competing products, while ensuring quality. What’s more, they benefit public health, safety and the environment. When you think about all that standards do, they are indispensable for today’s society. TIA operates nine engineering committees that develop guidelines for private radio equipment, cellular towers, VOIP equipment, structured cabling, satellites, telephone terminal equipment, accessibility, data centers, mobile device communications, vehicular telematics, smart device communications, and smart utility mesh networks. More than 1,000 individuals - representing network equipment manufacturers, service providers, government entities, and end users - currently serve on TIA's Engineering committees. 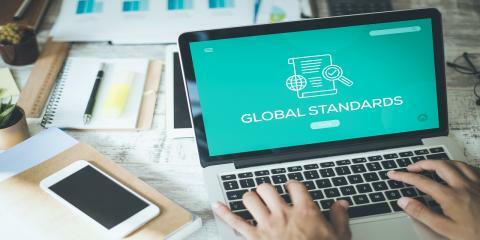 To ensure that these standards become globally established, TIA collaborates with the International Telecommunication Union (ITU), the International Organization for Standardization (ISO), and the International Electrotechnical Commission (IEC). Read American National Standards Institute's "Standards Boost Business" report.